Okay, so we bought this button-down at Vermont Flannel and we have hardly taken it off, so we feel like we need to tell you about it. THIS IS THE SOFTEST, COMFIEST SHIRT YOU WILL EVER WEAR. The Vermont Flannel Company hasn’t changed its American made product since 1991. These flannels are hand cut and sewn right here in Vermont. Husband and wife team Mark and Linda Baker are dedicated to quality and service. The reason for their true-to-size, washable nature is all the yarn is dyed individually before being tightly sewn and weaved together. Available patterns are plaid, plaid and more plaid, but there are lots of colors to choose from, in addition to your standard red and black. Beyond giving you pretty much the best shirt ever, Vermont Flannel Company also gives a lot to the community. For example, when we were in the store, they were running a “Buy a Flannel Bag, Give 10 Meals” promotion, helping to feed the hungry with proceeds from your purchase. The nearest Vermont Flannel store is located in Woodstock, a great place for a day trip when you’re not conquering the mountain. It’s only 25 minutes from our lodge, full of shops and restaurants. You can read all about the town in our Woodstock blog. 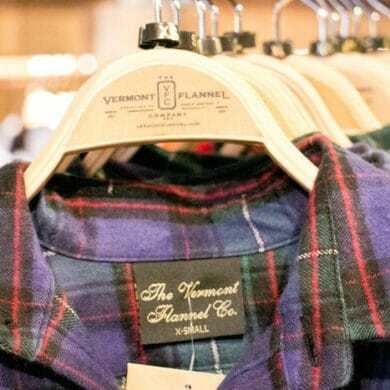 The Vermont Flannel Company is located at 13 Elm Street in Woodstock VT. For additional locations or more information, please visit the Vermont Flannel Company website or call (800) 232-7820.